Giant Coin Cardboard Cutout Prop - Dino Rentos Studios, INC. 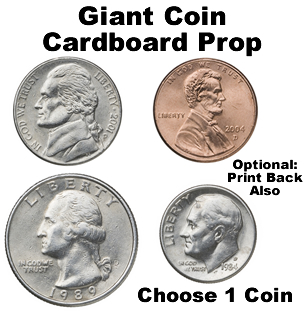 This Giant Coin Cardboard Cutout Standup Prop is great for your casino or retail display! Price is for one coin of your choice -- select below. Pick from Quarter, Nickel, Dime or Penny. Call to order larger coins.